Or Norm Abrams, if you like. This one comes from a FB reader who is a librarian. ...just this week I experienced the horror of the 6" circular saw blade bookmark inside "Inside Every Woman"
"Fashion illustration of two men in checked and plaid sack suits, 1880." And it looks to be the same suit. I wonder what the connection was between the writing and the picture? I was going to use Jason Vorhees or Freddy Kreuger or something along those line for the title, but I couldn't recall anyone causing mayhem with a circular saw. Hatred of women???? That is really all this conjures for me. Nasty. The second one is dapper, and endearing really. Nice. a little context: the fellow in the suit is a young Oscar Wilde. 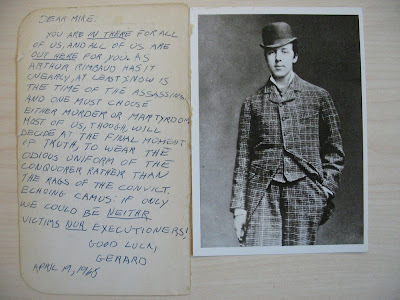 Postcard and note were in a pile of Wilde texts donated to the library. 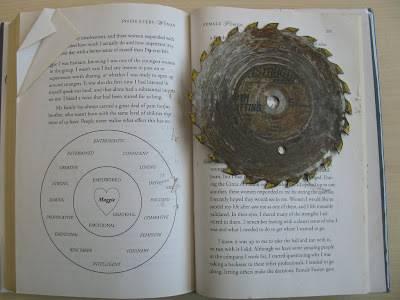 the saw blade book was checked out to a woman, which isn't to say it wasn't her husband's sawblade or reading material. I do like that it echoes the illustration on the opposite page. well... that would explain my upset stomach last night. okay, someone aspiring to something long past? he sounds like a lamenting hippie about to commit a regrettable act. Because of the suit, I too thought the photo was Oscar Wilde, before he adopted the lapel carnation. Glad to know my supposition was correct. But the saw blade...I've grabbed many things for bookmarks on the fly, but *never* a saw blade. Amazing it didn't fall out on the trip back to the library! well, that's Oscar Wilde, so I'd think that the letter accompanying it was a thinly-veiled message about staying in or coming out of the closet and/or standing up for what you believe to be important. rather lovely really. but the saw blade! ouch!